Thoughts on Eminem’s “Venom” music video. The “Fall” video sees Eminem, disappointed by critics’ of “Revival”, running from a dark entity, which desires to absorb him, merge with him (this reverberates with Slim Shady, his alter-ego, which left the scene for Marshall to create his previous emotional, personal album). 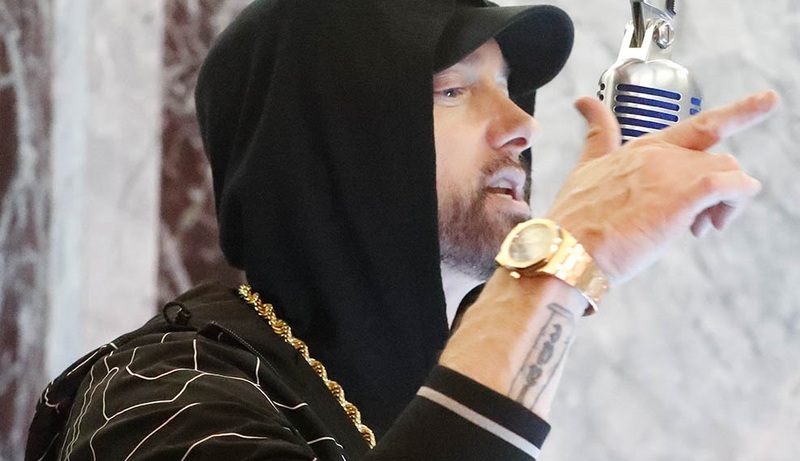 At the end of the video Eminem, having given up to the dark force, merges with it, throws out the “Revival” CD, and walks away, stepping on it (symbolically showing that his darker side, Slim Shady, has taken over, awakened by the critics). The ending gave rise to many rumors and suggestions. Many people thought Em was unsatisfied by his work same as he was with “Relapse” and “Encore”. Friday, October 5th, after the whole world saw “Venom” video, all suggestions turned out to be false. The “Fall” video was the background to “Venom”. The beginning of the video sees a teenager who finds the CD that was thrown and trampled by Em at the end of “Fall”. The CD turns out to be host to a symbiote, who jumps from one host to another throughout the video. Thus, Em builds a metaphorical comparison of his career, his “contagious” and “symbiotic” music, which conquered generations, and the plot of movie “Venom”, in which a symbiote from space merges with a human to form a super-being, an antihero. For those of you who watched the movie or have a grasp on real life, an antihero doesn’t always has to be the bad guy. So the theme of the movie, as well as the personality of its main character, turned out to be appealing to the hip-hop artist, apparently reminding him of the beginning of his own career and the struggle between Marshall and Slim Shady, the artist and the symbiote who parted ways for the recording of “Revival”, but came back together when the artist needed to lash back at critics and fickle fans, who booed the album. The video is shot is styled in the theme of the movie, and is full of references to its plot. The director successfully uses artistic techniques and the character’s behavior patterns to convey the idea of the fans’ obsession with Eminem’s music.